Buy the sweater, get the necklace. 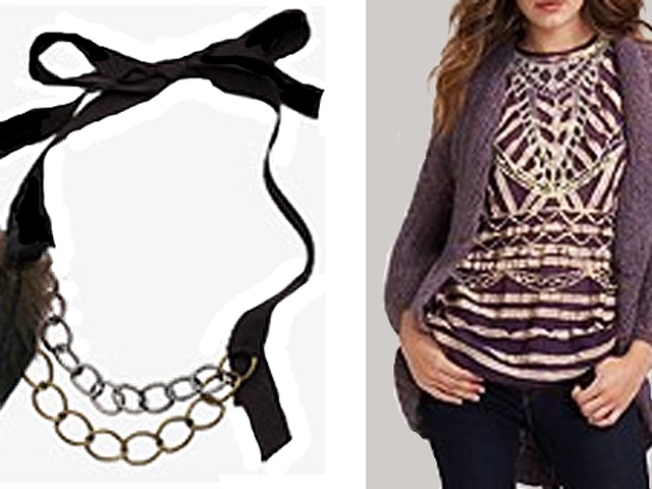 YES, YES, NANETTE: Score a free feather-and-chain necklace with a $300 Nanette Lepore purchase at Saks Fifth Avenue. (Yeah, we WISH.) But if you're willing to make the splurge, we suggest the openwork belted cardigan ($398), a lacy wool/mohair number that's making us feel ready for fall all of a sudden. Use code NANETTE3 to get the free necklace when you order online. BUDDHA LOUNGER: Who ever said it's impossible to find enlightenment on the couch? This Buddha men's tee ($48) from lululemon athletica cuts right down to the heart of the matter: The practice of non-extremism obviously involves some down-time with reality TV, right? Find your bliss online or at 3265 M St. N.W. ; 1515 15th St. N.W. ; 2847 Clarendon Blvd., Arlington; 4856 Bethesda Ave., Bethesda or Tysons Corner Center. DRESS IT UP: Indulge your need to create -- without having to actually get dirty -- via Russell & Mackenna's build-your-own dresser, fully customizable according to your own whims. Choose primary and accent colors, cubbies versus drawers, knobs, backdrop and more. Our fiery version here is $3,184, but basic dressers tart at $2,600. Sure, it's pricy, but it's one-of-a-kind you. You can also choose from the Amelia armoire (starts at $3,250), a double dresser (starts at $3,400), or the shortie dresser (starts at $2,400). Available from online or at 8R Evergreen Road, Severna Park, Md.